What are the five types of tornadoes? Rope Tornadoes are the smallest and most common of tornadoes. They get this name from their rope-like appearance which is narrow and long. Rope Tornadoes are the initial forms of tornadoes before they grow in size, becoming massive twisters. They can still be dangerous despite their small size. Like Rope Tornadoes, Cone Tornadoes too get their name from their shape. Their diameter is smaller at the point of contact on the ground when compared to the width at the end of the associated thunderstorm. Cone Tornadoes are stronger than rope tornadoes because of their large diameter. Wedges Tornadoes can spread over half a mile or greater. They appear to have a greater width as compared to their height. Most of the dangerous tornadoes fall into this category and destruction is imminent in these cases. Multi-vortex tornadoes consist of two or more swirling areas in a single twister. These additional twisters are typically rope tornadoes whirling around the main tornado. However, in some cases, there can be two tornadoes swirling independent of each other. These type of tornadoes are known as satellite tornadoes. Unlike their counterparts, waterspouts and landspouts can form in the absence of thunderstorms. Waterspouts are only counted in as tornadoes when they hit the land. Though they are weaker than most tornadoes, they still possess enough force to overturn boats and change sea conditions. Similarly, landspouts are weak forms of tornadoes; however, they can create damage similar to that of an EF-0 tornado. What are some other names for a tornado? Some alternate names for a tornado are a twister, tropical cyclone, hurricane, typhoon, and whirlwind. The names differ by the geographical area. In Australia, a tornado is described as a tropical cyclone. In the United States, it is referred to as a hurricane. The Asian continent addresses it as a typhoon. What is a stovepipe tornado? A stovepipe tornado is a tornado that looks similar to that of a stovepipe. It has a typical cylindrical structure, with the width at the point of contact on the ground and the base of the thunderclouds being pretty much the same. Wedge tornadoes are a wide form of tornadoes. Their significant difference in width as compared to their height is the highlight characteristic. They can be conical (like that of cone tornadoes) or cylindrical (like that of the stovepipe tornadoes). Because of their broad coverage, they have a higher potential for causing destruction. What are the categories of tornadoes? There are five categories of tornadoes, namely: EF-1, EF-2, EF-3, EF-4, and EF-5. EF-0 tornadoes have estimated wind speeds between 65 to 85 MPH. There will be damage to chimneys, along with breaking of tree branches, bending of shallow-rooted trees and destruction of signboards. EF-1 tornadoes have estimated wind speeds between 86 to 110 MPH. Mobile homes and cars are pushed away. EF-2 tornadoes have estimated wind speeds between 111 to 135 MPH. Roofs of houses are blown away, mobile homes get demolished, along with uprooting of large trees. EF-3 tornadoes have estimated wind speeds between 135 to 165 MPH. A large number of trees are uprooted, trains get overturned, heavy automobiles are thrown away. EF-4 tornadoes have estimated wind speeds between 166 to 200 MPH. Houses get blown away along with cars blown away at high speeds. EF-5 tornadoes have estimated wind speeds beyond 200 MPH. Large houses get lifted and destructed along with trees and cars swirling in the air. The wind speed estimates are with reference from the Enhanced Fujita Scale. What is a Tornado Alley? 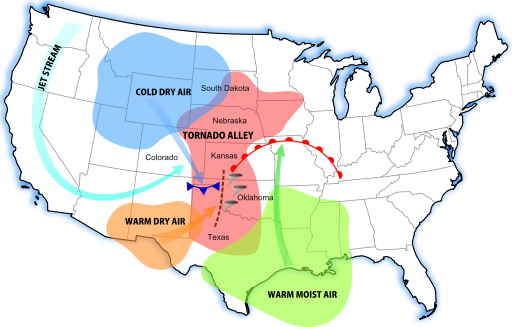 Tornado Alley is a term coined for the area of the United States that is prone to the formation of tornadoes. The 18 states which make up the Tornado Alley are Texas, Oklahoma, Kansas, Nebraska, Eastern Colorado, North Dakota, South Dakota, Arkansas, Louisiana, Mississippi, Iowa, Tennessee, Kentucky, Wisconsin, Minnesota, Indiana, Missouri, and Wyoming. *There are only 18 states which come under the Tornado Alley. Has there ever been an F5 tornado? What is an EF 0 tornado? An EF0 tornado is the weakest tornado according to the Enhanced Fujita Scale. The Enhanced Fujita scale is the standard form of classifying tornadoes by estimation of wind speed based on the damage caused by the tornado. An EF0 tornado is a tornado that has estimated wind speeds between 65 to 85 MPH. Can multiple tornadoes form at once? Yes, multiple tornadoes can form simultaneously. Such tornadoes are known as multi-vortex tornadoes. These types of tornadoes typically have a parent twister around which there might be one or more smaller rope tornadoes. However, sometimes there might be multiple large tornadoes moving independently of each other. In such cases, they are known as satellite tornadoes. What are the parts of a tornado called? All tornadoes, regardless of speed and size, are dangerous. Weakest of the tornadoes can have wind speeds of around 65 MPH which can cause some damage even if it is not severe. 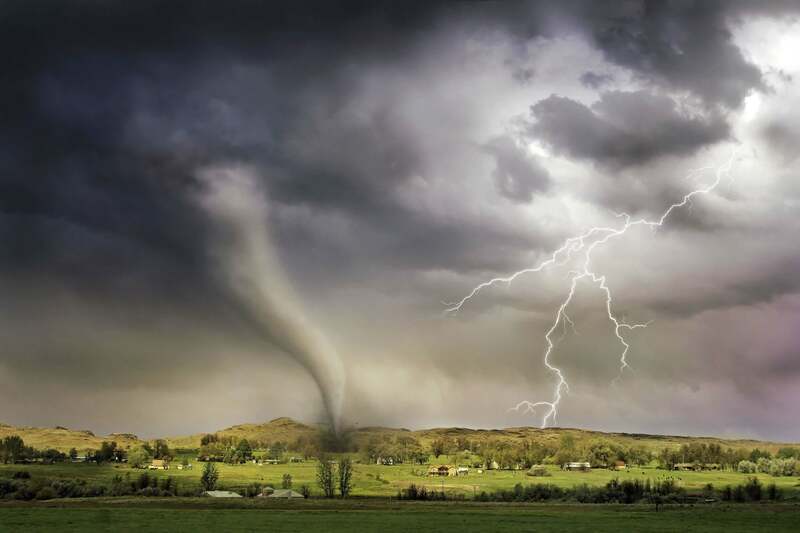 A 65 MPH tornado might not blow away concrete structures like houses, offices, and stores but can affect light structures like overturning boats, blowing sheds, or breaking tree branches. How do you know that a tornado is coming? There are many warning signs that a tornado is coming. One sure way to detect whether or not a tornado is coming your way is to use a tornado detection device. This device is NASA-certified and validated to be accurate and reliable. If you live in a tornado valley states (discussed above), it is highly advisable to get one of these devices for your protection.